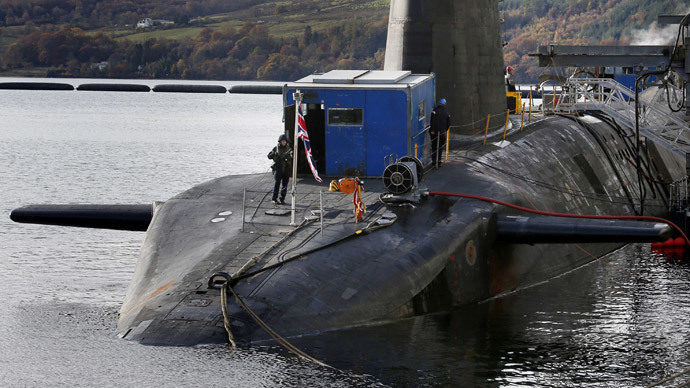 The UK’s Trident nuclear deterrent has been branded “irrelevant” by the Scottish Trades Union Congress (STUC), which says the weapon system no longer fulfills the needs of Britain’s security forces and faces a marked fall in public support. STUC’s statement mirrors the sentiments of the Scottish National Party (SNP). SNP leader Nicola Sturgeon vowed on Monday the party would block any defense spending decisions in a coalition with the Labour Party unless Ed Miliband promised to scrap Trident. In a combined report by the STUC and the Campaign for Nuclear Disarmament (CND), the authors ruled that Trident no longer lived up to its initial function, under the Cold War-era policy of Mutually Assured Destruction (MAD). The report argues the greatest threats to UK security (aside from North Korea) no longer possess nuclear weapons. Should Britain use one of the missiles against a non-nuclear armed country, the impacts would be disastrous for the population and the environment, it states. The nuclear weapons system, which is stationed at Faslane, Scotland, and is up for renewal, has drained funds from the UK’s military budget, which is already squeezed by the current austerity program. “We do not believe Trident provides an effective deterrent to the genuine threats currently posed to the UK. Cancelling Trident’s replacement would both accelerate a worldwide reduction in nuclear arsenals and boost the campaign against proliferation,” STUC General-Secretary Grahame Smith said. “The Agency must be properly resourced and adequately staffed. It should comprehensively engage with trade union representatives and other stakeholders in the local and national economies to develop and implement realistic plans for diversification that have the confidence of the workforce,” Smith added. Currently the only major party pledging to scrap Trident renewal is the Liberal Democrats, which is part of the ruling coalition. Both Labour and the Conservatives have vowed to protect the missile system. “The report clearly shows that a properly resourced Defence Diversification Agency with workforce involvement would be a key factor in allowing communities to prosper following the cancellation of projects such as Trident replacement,” Scottish CND chair Arthur West said.